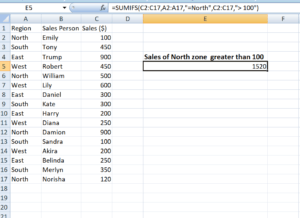 What is the SUMIFS Function in Excel? We all know the SUMIF function allows us to sum the data given based on associated criteria within the same data. 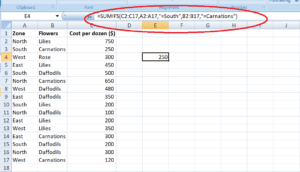 However, the SUMIFs Function in Excel allows applying multiple criteria. Criteria1 = Used to determine which cells to add. Criteria1 is applied against criteria_range1. Criteria_range2, criteria2, … = The additional ranges along with their associated criteria. SUMIFS will return a numeric value. Rows and columns should be the same in the criteria_range argument and the sum_range argument. 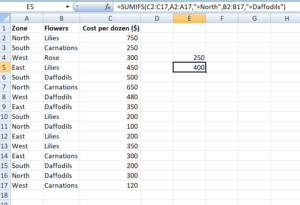 Similarly, if I wish to find out the total cost of Daffodils for the North region, I can use the same formula. Let’s take an example to understand this in detail. Wildcard characters such as ‘*’ and ‘?’ can be used within the criteria argument when using the SUMIFS function. Using these wildcards will help us in finding matches that are a similar but not accurate match. Asterisk (*) – It matches any sequence of characters. It can be used after, before or surrounding criteria to allow partial search criteria to be used. Question mark (?) – It matches any single character. Suppose I apply N?r as the criteria. Here “?” will take the place of a single character. N?r will match with North, Nor, etc. However, it will not take into consideration Name. What if the given data contain an asterisk or an actual question mark? In this case, we can use “tilde (~)”. We need to type “~” in front of the question mark in that scenario. 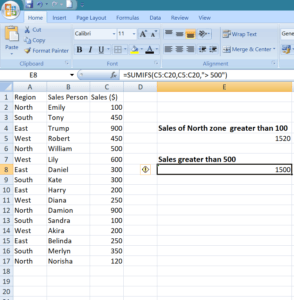 Named range is the descriptive name of a collection of cells or range in a worksheet. We can use named ranges while using the SUMIFS function. When using SUMIF, we can evaluate only one condition, whereas different criteria can be evaluated under SUMIFS formula. This is the primary difference between the two Excel functions. 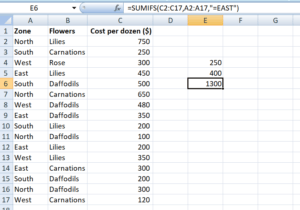 SUMIFS is available from MS Excel 2007. The SUMIF function can be only used for adding a single continuous range based on a single specified range with a single criterion, whereas, SUMIFS can be applied over multiple continuous ranges. Don’t forget to check CFI’s Free Excel Crash Course to learn more about functions and develop your overall Excel skills. Become a successful financial analyst by learning how to create sophisticated financial analysis and financial modeling.